given the symptoms I listed below, I thought this was a straightforward bad alternator. The car eventually stopped being able to idle on it's own so I had the mechanic come out today and test it for me to confirm. However, the car started up normally and presented no issues, a normal readout at the battery, and idled perfectly. Of course, the mechanic left, I started the engine again and it presented the issues once more. The more electrics I turn on, the more the battery gauge dips. Keeping them on causes the gauge to fall further and further. The more the battery gauge dips, the worse the car feels while idleing. Feels juddery while sitting idle. Drives perfectly fine though. Moving between Reverse and Drive causes a large dip in the battery gauge. Eventually the car cannot idle on it's own. As soon as I stop holding the revs with the gas pedal, the car dies. The symptoms listed above are not constant. I come back a week later and it starts fine and idles perfectly. The battery gauge looks like it's being slowly drained until it dies, but the car started up fine the next time showing a full charge. Moving the shifter between Drive and Reverse causes the the whole car to move. I don't think this is related, it has always done it but given the large dip in the battery gauge I thought it worth mentioning. The car has always had an issue where the power dips for half a second randomly. This used to cause the ASR and ABS to turn off when the dip happened until I restarted the engine. (They no longer turn off since I replaced the BCM for a different issue). The battery is faulty despite not being very old. (I'm not sure about this as it wouldn't explain the car feeling so juddery during idle and being unable to hold idle on it's own). The alternator is faulty but the fault is intermittant. (However, when the car does start being normal again, I would expect the battery to be low instead of full). Not a particularly helpful video as I recorded it during the early stages of the problem when I noticed something was wrong. Looking closely, yyou can see the gauges moving up and down. The battery gauge moves much more dramatically now. Apologies for a wordy post, I'm just trying to be as descriptive as I can. Any help or suggestions would be appreciated. After some playing around today, I discovered that the car does behave perfectly normal for the first 10-15 minutes. After this time, turning all electrics on and shifting between Drive and Reverse repeatedly, I can see an obvious drop in the battery. 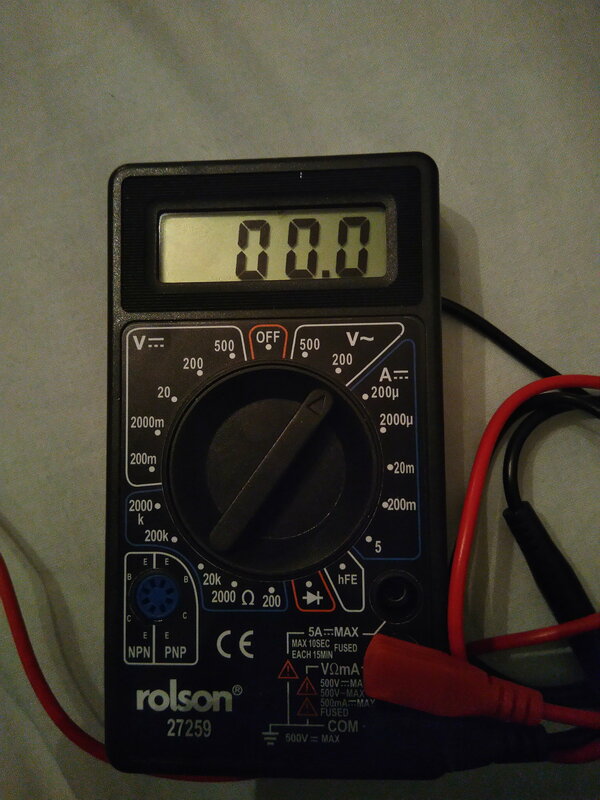 I measured at the battery with a multimeter. It read as a steady 30.6 initially, with random half-second dips to 30.5. Steadily over time, this value drops further and further, with the battery gauge reflecting this drop. It looks to me like the alternator starts off strong but fades over time the longer the car runs. I wanted to make sure this wasn't a silly idea before I buy a new one. Your battery read 30.6 ? What were you measuring, since it definitely wasn’t volts. Sounds like the voltage regulator in the alternator is hat soaking. Does the voltage regulator come as part of the alternator if I order a new one or is it an external component? Your meter is set to a 200 volt AC (alternating current) scale. Auto systems are DC (direct current). You would measure the battery voltage using the 20 V DC scale on the left side of the meter. You have a 12 V battery. I'll have to check w/ my electrical engineer buddy.... I would think getting 30 volts AC at the battery might indicate the rectifier in the alternator was defective, but never trust a mechanical engineer to answer an electrical question..... LOL. The voltage regulator is an internal part of the alternator. A new alternator will come with a new regulator. I've ordered a new alternator so we'll see if that does the trick when it arrives. Alternator is poop; What's a good alternator brand?